The floods affected north and central Vietnam, as well as southern China after three days of heavy raining. The rainfall, which began October 30, is the heaviest in 24 years, a state meteorological official told the Vietnam News Agency, and were the worst floods in Hanoi since 1984. At least 66 in Vietnam and 34 in China have been killed because of the flooding. Overall, 15,000 families evacuated their homes, and almost 100 schools, 100,000 houses, 241,000 hectares of crops, and 25,400 hectares of fish farms were submerged or damaged in the floodwaters. In Hanoi, 18, including 3 children, were found dead after 13 more bodies were recovered. 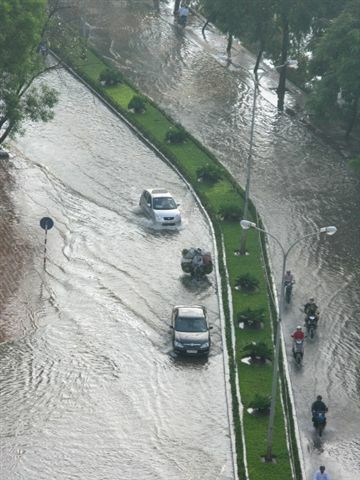 Up to one meter of water flooded the city’s streets, and transportation was halted. Prime Minister Ngo Dinh Diem defeated Emperor Bao Dai in a fraudulent referendum supervised by his brother Ngo Dinh Nhu on the future of the monarchy in South Vietnam. The State of Vietnam referendum of 1955 determined the future form of government of the State of Vietnam, the nation that was to become the Republic of Vietnam. It was contested by Prime Minister Ngo Dinh Diem, who proposed a republic, and former emperor Bao Dai. Vietnam declares its independence, forming the Democratic Republic of Vietnam. The Democratic Republic of Vietnam (Việt Nam Dân Chủ Cộng Hòa) was a country on the northern half of Vietnam. It was proclaimed by Hồ Chí Minh in Hà Nội on September 2, 1945 with a declaration of independence, following the August Revolution, as a communist provisional government. It gathered Tonkin and Annam, provinces of the French Indochina. North Vietnam won the Second Indochina War, which is referred to outside the region as the “Vietnam Conflict”, the “war in Viet Nam” , or more simply, “Vietnam”. The government of North Vietnam took over South Vietnam and it became the larger Vietnam that exists today with the same political system and organization.